Beautifully handicrafted from paper mache around a frame from metal wire then handpainted by mastercraftsmen in Andhera Pradesh (central India). 16cm high en 23 cm long. Beautifully handicrafted from paper mache around a frame from metal wire then handpainted by mastercraftsmen in Andhera Pradesh (central India). 15cm high en 20 cm long. Really big very cuddly clown made by our sewing ladies in Tamil Nadu from cotton with polyester fiberfil stuffing. 42cm tall. Paper mache India dancing doll. 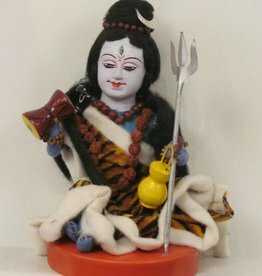 This serene Shiva-ji Golu Doll is an exquisite collectors item. For home temple or room. Made of stuffed textile and painted ceramics, height 25 cm. Bestow on the creator the love he deserves and bring him into you life.